I have no clue where I saw that first. 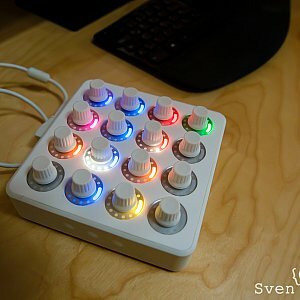 But several months ago I learned that you could control Lightroom with a MIDI controller. At first, I only saw devices with physical slider bars. It was possible to move the slider from the bottom to the top to control for example the brightness from min to max. But if you switch to the next image, the position of those sliders do not reflect the current settings. You need to fiddle around with getting the image right again. Bad thing. Of course, there are devices with motorized sliders out there. But they are costly. Also, you need to choose between a bulky device or a limited number of sliders. The KORG nanoKONTROL2 is an example for this type. 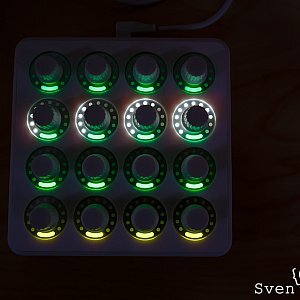 The next step is a MIDI device which features infinite dials instead of sliders or limited dials. The good thing here is that at this point you can start with relative settings. If you switch to a new image, the position of the dial reflects the settings you did for your image. Automatically! Some LEDs help to see the settings directly on the dial. The Behringer X-Touch Mini USB is such a device. 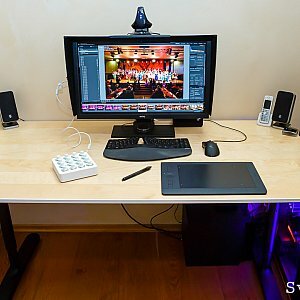 While watching some videos which compare different devices regarding their usability for Lightroom, I learned that the dials of the Behringer X-Touch Mini USB do snap from one position to another. You can't use a position in between. So I ruled this device out. 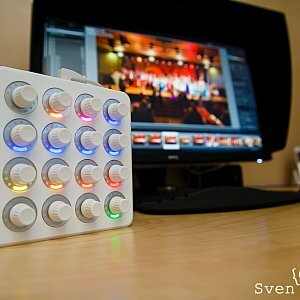 Next try: Dj Techtools P554-1 Midi Fighter Twister. It features 16 smooth moving infinite dials. 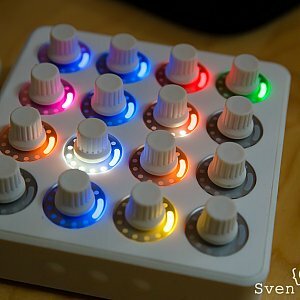 Each dial is a button, customizable dial colors, great visualization of the current setting and some additional switches on both sides. Awesome device! But the rubberized finish draws dust like crazy. Still, it is a very nice device. Check the images below. To use a MIDI device with Lightroom, you need a plugin. There are several for MacOS, for Windows I used MIDI2LR. It's an open source tool which installs smoothly. Once I learned that I couldn't open both the controller configuration tool and MIDI2LR, it started working. A small tool window recognizes and highlights the dial you turn and the button you press. That makes it very easy to assign Lightroom features. I configured it in a way I don't need the mouse or keyboard while going through the images. There are buttons to go the prev/next image, do the auto exposure, reset the last moved setting, mark/unmark images and reset the rotation. Dial wise I assigned the color temperature, brightness, highlights, shadows, white, black, clarity, vibrancy, vignette, fog removal and rotation. If you counted: there are still some free spots. By configuring different colors to those settings, I'm able to spot the right dial easily. Using those settings made it possible to go over about 800 shoots very fast. Especially the ability to reach settings without scrolling around the settings bar saves a lot of time. You know where they put the fog removal tool, right? If you did an event shooting where the LJ fell in love with fog and pink light you'll know what I mean. 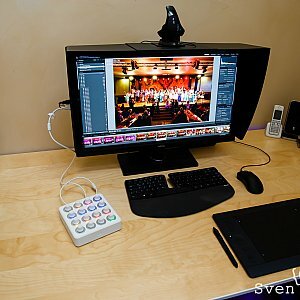 There is another Lightroom plugin you can use: LrControl Lightroom Plug-in. It is a commercial one and is dedicated to the Twister MIDI controller.